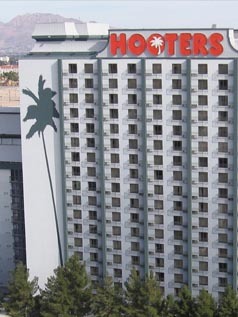 Hooters Casino Hotel is owned and operated by 155 East Tropicana, LLC (Florida Hooters, LLC 66.67% & EW Common, LLC 33.33%). It is located off the Strip next to the Tropicana and across the street from the MGM Grand Las Vegas. The hotel has 696 rooms with a 35,000-square-foot (3,300 m2) casino. Casino: Yes, 30,000 square feet. 670 slot and video poker machines and 32 gaming tables offering Blackjack, Craps, Caribbean Stud Poker, Roulette, Pai-Gow Poker, Let It Ride and Keno. A poker room is located at Pete & Shorty’s Book and Bar. Race & Sports Book: Yes, Pete & Shorty’s Book and Bar. Restaurants: Hooters has the following dining options: Hooters, Pete and Shorty’s, The Bait Shoppe and Mad Onion. Entertainment: Men of X performs in Dixies Dam Bar. The Night Owl Showroom is home to several shows including The Dirty Joke Show . Purple Reign-The Ultimate Prince Tribute Show also performs in the showroom. Other Entertainment is featured in the Nippers Pool Bar and the Porch Dogs club. Nightlife: Porch Dogs, Dixie’s Dam Bar and Pool Bar. Pool: Yes, two pools and two hot tubs. Shops: Yes, two gift shops, the Bait Shoppe and Splurge, and Tito Ortiz’s Punishment MMA Store. Business Center: Some services available at the front desk. Convention Rooms: Yes, 2,800 square feet. Room Service: No, but Hooters Wings and food from Dan Marino’s is available to go 24 hours a day. Hotel Amenities: Concierge services, currency exchange, luggage and maid service, safety deposit box, wake-up calls. Standard Room Amenities: Air conditioning, alarm clock/radio, remote-controlled 27-inch cable TV, hair dryer, desk, electronic door locks, iron and ironing board, in-room safe, telephone, voice mail. Incidental Charges: Hooters has a $7.50 + tax per night / per room resort fee which covers the cost of pool and gym access, local and toll free 800 phone calls, in-room safe and two in-room bottles of water. This fee is not included in your reservation and will be charged at the hotel. Hooters requires a $25 per day credit/debit card hold for incidental charges and cash cannot be accepted in lieu of credit/debit card.